The Minstrel concept also includes a suitable sling for the type of resident/patient and use. Sling solutions are available in a wide range of special purpose designs and sizes. This easy-to-use aid enables caregivers to handle everyday lifting and transfers comfortably, safely and without stress. 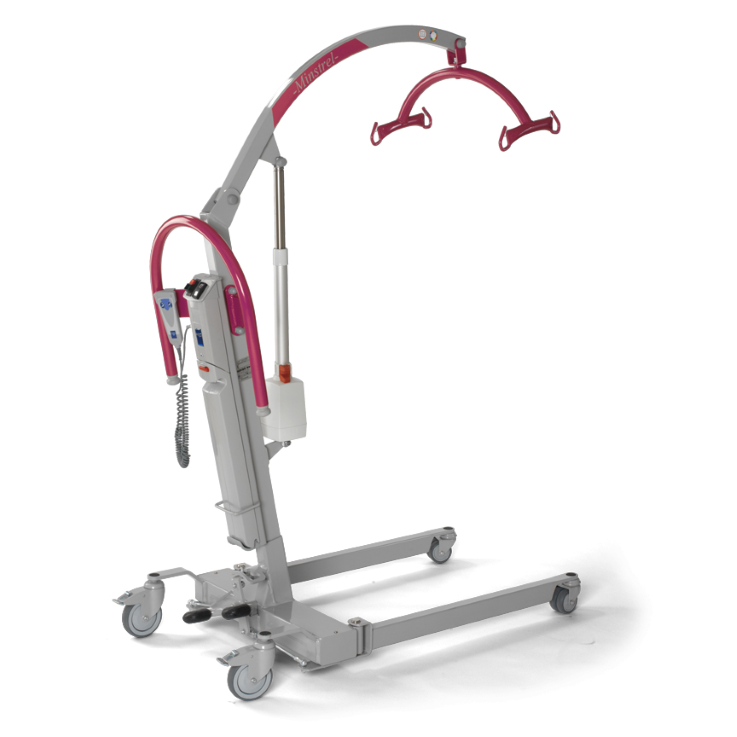 In the event that a resident/patient should fall down, the Minstrel allows a single caregiver to lift them up from the floor without having to manually sit the resident/patient up. As a general purpose lift, the Minstrel is a good asset for small care facilities. Its user-friendliness and versatility encourage frequent and cost effective utilisation. Proven battery-powered lifting technology operated via a handheld control unit provides high standards of safety and comfort for both resident/patient and caregiver. Minstrel has a solid hanger bar assembly that will prevent swinging and swaying of the resident/patient adding to their overall safety and sense of security. Minstrel is also available with a scale option,allowing the carer to quickly weigh their resident/patient whilst performing a transfer. The chassis can be opened by a simple foot pedal to allow close access and maneuverability around large chairs, wheelchairs, beds and toilets.